13.05.2014: Book Launch: Africa’s Peacemakers: Nobel Peace Laureates of African Descent, Berlin - INISA e.V. As Africa and its Diaspora commemorate 50 years of post-independence Pan-Africanism, this unique volume examines critical lessons of peacemaking, socio-economic justice, women’s rights, environmental protection, and nuclear disarmament from the 13 prominent individuals of African descent who have won the Nobel Peace Prize since 1950. The book is centred around the first American president of African descent, Barack Obama, whose father was Kenyan and whose career was inspired by the civil rights and anti-apartheid struggles promoted by other key individuals such as Marin Luther King, Jr., Nelson Mandela, Desmond Tutu, and Albert Luthuli. 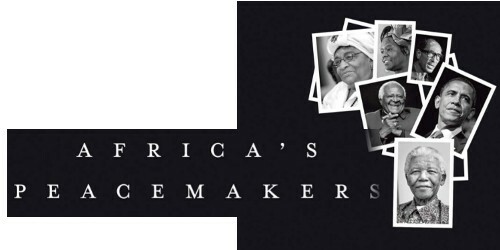 Key lessons for peacemaking are drawn from figures such as Ralph Bunche, Anwar Sadat, Kofi Annan, and F.W. De Klerk; as well as lessons for women’s rights, environmental protection, and nuclear disarmament from Ellen Johnson Sirleaf, Leymah Gbowee, Wangari Maathai, and Mohamed El-Baradei.